The Bell company brought a history of vertical-lift Tilt-Engine system development to this program when it combined with Boeing in the early 1980s. The company had demonstrated such a system with the XV-3, proving that it was possible to turn wingtip rotors from a vertical position to horizontal, thus providing the thrust to lift the vehicle off the ground and then transition to horizontal flight. The XV-3 was followed by the XV-15, which would closely resemble the V-22, with the XV-15 initially serving as the test vehicle for the V-22. During the early 1980s, the Bell-Boeing competed for the Joint Services Advanced Vertical Lift Aircraft (JVX). Then, on April 26, 1983, the joint team was awarded the contract to begin the preliminary design stage. Initially called the Bell/Boeing-Vertol JVX, the plane would later be given the V-22 Osprey designation, and later, special mission variations carrying the designations of MV-22, HV-22, and CV-22. The 1983 plan called for 1086 of the tri-service VTOLs to be produced with a total procurement cost of $25 billion, with the funding to be shared by the three services. The Navy was to assume the bulk of the obligation with 50 percent contribution. The initial requirement called for the craft to be capable of carrying 24 troops. 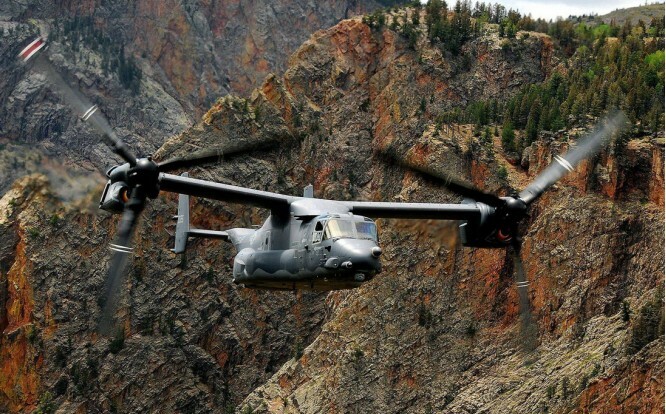 Power for the Osprey comes from a pair of General Electric T64-GE-717 turboshaft engines, each rated at 6150hp, and the V-22 weighs about 24800kg at maximum take-off weight in a STOL configuration, and about 19840kg in a pure VTOL mode. Its empty weight is just over 14880kg. The rotor diameter is 11.6m, with an overall fuselage length of about 17.4m. With the rotors in the take-off position, the height of the vehicle is just over 6m. The width of the vehicle, with the rotors turning, is almost 26m. Those rotors are capable of rotating through 97 degrees and are constructed of graphite/glassfibre. 33 percent of the weight of the Osprey is fabricated of graphite/glassfibre. The rotors also possess separate cyclic control swashplates for sideways flight and fore-and-aft control during hover. Lateral attitude is maintained by differential rotor thrust. Once the V-22 achieves horizontal flight, the engines have assumed a position parallel to the fuselage. The V-22 can fly backwards by tilting the rotors back past the 90-degree vertical position. Initial performance requirements for the Osprey were a cruising speed of 480km/h with a range with a full payload of over 1450km. Even though the V-22 carries a cargo designation, it does carry a nose-mounted 12.7mm multi-barrel machine gun. There are redundant systems, along with armor, in critical areas. The composite materials also provide protection, and one engine can power both rotors if required with a cross-coupling capability. The full-scale development program began in May 1986 with the order for six prototypes. Numbers 1, 3, and 6 were constructed by Bell at Arlington, Texas, and numbers 2, 4, and 5 by Boeing at Wilmington, Delaware. 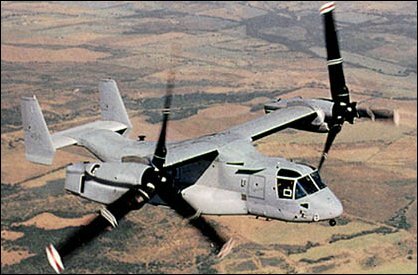 The world’s first operational tilt-rotor transport, the Bell/Boeing's V-22 Osprey tilt-rotor made a successful first flight on 19 March 1989 with "near perfect performance" reported during a series of vertical take-offs and landings at Arlington, Texas. Wearing grey/green US Marine Corps camouflage, the fourth Bell Boeing V-22 Osprey flew for the first time from Boeing Helicopters flight test centre on 21 December 1989. The flight marked the beginning of V-22 flight test activities at Boeing's facility in the Delaware Valley. The first flights for the last test vehicle occured in 1991. In 1995, the production of test vehicles resumed with numbers 7 through 10 for vibration, propulsion, USMC, and mating evaluations. Final assembly of the first production V-22 was completed in late 1998. In early 1998, the V-22 accomplished its first night test flight. During the test, the V-22 flew with a neutral density filter which covered the cockpit displays. This allowed the pilots, which were using night vision goggles, to operate the displays in the day mode. Also included in the flight test program was to investigate its capabilities for carry external loads. In one test, the number eight prototype carried a five-ton sling load through the transition phase with a top speed of 425km/h. The test pilot indicated that even though he could feel the load oscillating beneath him, it didn't affect the craft's performance. The testing showed that certain loads caused dramatic shifts in the center of gravity of the V-22, which in turn required a change in the attitude of the aircraft. It was determined that that requirement could be accomplished by changing the angle of the engine nacelles. Other tests planned at the time included a sling weight of 6765kg and a Humvee jeep. Early crashes of two prototypes, both in 2000 and resulting in fatalities, nearly did the system in. With pressure mounting to produce, and the general kinks reportedly ironed out, the system was passed for full scale service in 2006. In 1997 low-rate initial production was undertaken for 23 V-22s (called MV-22s) for the USMC. The first MV-22B Osprey tilt-rotor was delivered to the Marines in May 1999. 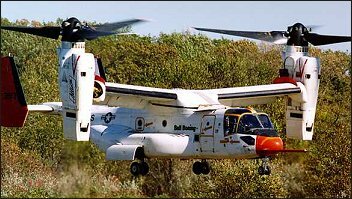 The US Navy has ordered the HV-22 version for SAR duties and fleet logistic support, but cancelled its interest in the Osprey program (HV-22 Combat SAR) in 2001. The projected cost of these first operational V-22s had a unit cost of $32.2 million each, a figure that was down considerably than the $41.8 million projected during the full-scale development program. The plane has attracted international interest, with both Israel and Australia both showing interest in the unique VTOL. Bell is building the wing section, empennage, and powerplant nacelles, while Boeing has the responsibility for the fuselage and landing gear. Bell is also responsible for the final assembly and initial flight tests. Propeller systems: 2 x three-blade.